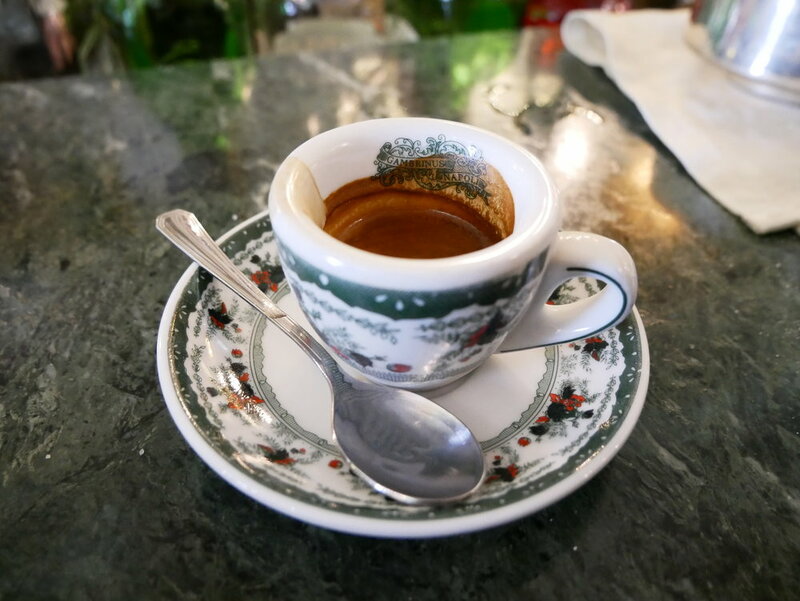 Naples is well known for its coffee culture; some say that the espresso was invented here, even! Could that be? With just a couple days in Naples, I knew that I had to hit up a couple of spots at least. I first went to Caffe Mexico, which you'll find right across from Piazza Dante in between Via Toledo and the National Archaeology Museum. Do they not have the most amazing decor and uniforms?! As soon as you walk in, you order and pay the cashier on your right. She'll give you a ticket which you then take to the bar. Then the barista goes off and makes your coffee. I've never seen these machines with the levers before! I've now read that these are piston-operated machines, and require a level of skill that's beyond the "normal" kind where you just push a button. This was my first coffee at Mexico - a caffe macchiato, espresso with a touch of milk. This is my standard order in Italy, but I soon learned by observation that actually the typical coffee to get here is just espresso with sugar already mixed in. So that's what I got the next time! Also by observing the patrons around me, I learned that you can leave the barista a little tip on your drink ticket. And you can also order a complimentary glass of water - either still ("acqua naturale") or fizzy ("acqua frizzante,") which you can see labelled on this tap with the Indian(?) drawings? 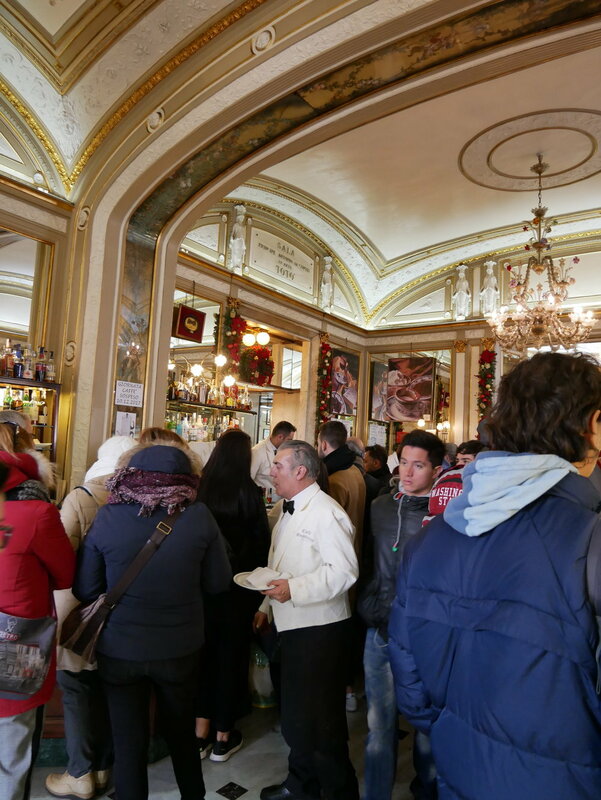 My other coffee spot was the Gran Caffe Gambrinus. This is a rather famous café, with a long history dating from the 1800s. It's right next to the Piazza del Plebiscito. This one's quite fancy-schmancy, but like Caffe Mexico, you still order and pay at the register, and then they give you the receipt which you show to the barista. I had to wait a bit for a spot to open, but since espressos really are express coffees which the Italians drink and run, I didn't have to wait long. I know that the good cafés warm up the cups, but this one was too hot to touch even! I did have to wait awhile for it to cool down enough to bring to my lips. But check out the detailed decoration - it even says "Gambrinus Napoli" on the inside of the cup. Espresso in Naples is hot, thick, and super intense. I really enjoyed it. My final stop was at the Naples Airport, of all places! The airport VIP Lounge, which I had access to thanks to Priority Pass (Priority Pass even entitles you to the express security line here! ), was very small - just 32 seats. But it did have a barista! Priorities, priorities. Though I was getting ready to board a 10pm flight, and didn't particularly need caffeine at this hour, I still wanted that final taste of Naples. So I got my last made-to-order Neapolitan espresso, and then it was time to leave.